Lobsang Sangay, Prime Minister of Tíbet in exile. Young, new to politics, and without much administrative experience. That is the political profile of the Tibetan Sikyong (prime minister). 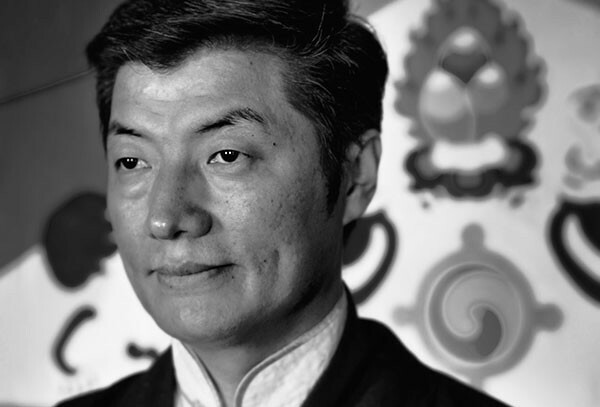 Lobsang Sangay has never set foot in Tibet although he has strong connections with the territory and its history. He was born in a Tibetan settlement in Darjeeling (India), to refugee Tibetan parents. His father was a monk who fled Tibet in 1959, the same year as the Dalai Lama. His uncle was shot dead. His pregnant aunt, unable to tolerate the injustices in everyday life, committed suicide by throwing herself into a river. 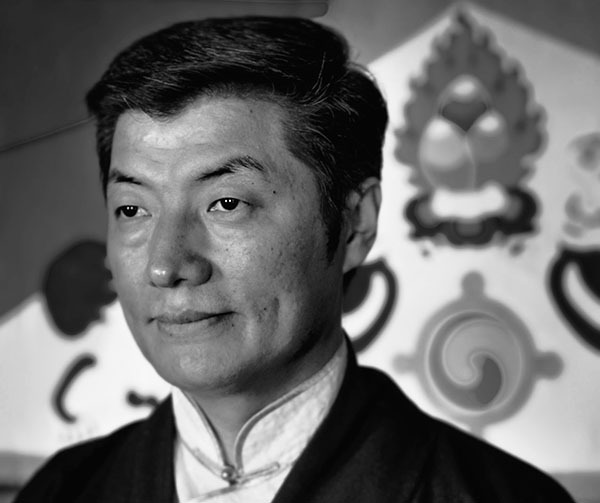 Sangay attended Delhi University and was the first Tibetan to be awarded a degree from Harvard Law School, where he remained as an academic, organising conferences among Chinese and Tibetan scholars during the 2000’s. The Dalai Lama’s decision in 2011 to relinguish political power opened the door to the electoral process in which Sangay was elected, against all odds, with 55% of the votes. He admits with amusement that working with the Dalai Lama is a privilege shared by no other world leader, and that after talking to him, problems seem insignificant. In recent years the keystone of Tibetan politics and strategy regarding China has been the so-called “Middle Way”, or the idea that through dialogue and non violence Tibetans can achieve autonomy within China similar to that enjoyed by Hong Kong or Macao. Meanwhile, Sangay governs in exile from Dharamsala in India. Despite not having been recognised by the Chinese Government, he repeatedly urges the Chinese authorities to sit down to talks and put an end to the repression against his people. You have been legitimised by the Tibetan community in exile but not by the 6 million Tibetans who live in Tibet and who have not been able to vote in the process and are not represented in the political structure. Do you know what they think of your election? Firstly, I was elected by the Tibetans in exile throughout the world. This includes all the Tibetans who left Tibet in the 90’s and 2000’s until very recently. So Tibetans inside Tibet have participated indirectly in the vote through them. Secondly, I have received many letters, prayers and popular songs from Tibetans inside Tibet. Songs mentioning my name, the elections and democracy. So there is clearly great acceptance and support for my election within Tibet. Also, I’ve been told and I’ve been shown many photographs of Tibetans who have my photograph, therefore, they are aware of my election and my stand. And what is more important, the previous political leader gave his political authority to the Dalai lama, who passed it on to me, so there is continuity in the legitimacy of the political authority received. As political leader of an occupied state, how do you represent six million people from a country in which you are a guest? I direct the Tibetan Central Administration, which functions like any other government. We have seven departments or ministries: Education, which runs over seventy primary and secondary schools and provides scholarships for college; Religion and Culture, with 260 monasteries in India, Nepal and Bhutan; Home, which oversees numerous Tibetan settlements; Health, which runs hospitals and clinics; International Relations with 12 embassies and many offices throughout the world; Security, and Finance. We thus function like any other government. We have a parliament with 44 members who meet twice a year, and I have been elected by Tibetans throughout the world, so it is like a presidential election. We have 600 fulltime employees and 900 working on contract. In some matters, such as municipal ones, the Indian Government is in charge of administering water and electricity, and also legal matters are submitted to the Indian courts. Apart from that, we manage matters ourselves. Do you think the death of the 14th Dalai Lama will be a turning point? Will it pose a challenge to the survival of the defence of the Tibetan cause as it is now stands? His Holiness is 79, but is in excellent health and will live many more years. I am sure that when the time comes many different points of views and strategies will be advocated, but non violence will remain our integral and non negotiable principle. The Middle Way is the mainstream policy and is supported by the vast majority. So we believe the matter must be resolved during the Dalai Lama’s lifetime. Different points of view are bound to happen and are already happening, but we shall resolve these differences peacefully and democratically. On what points do you differ with the Dalai Lama regarding how to interpret the Middle Way? It is the same policy: the Middle Way approach. The Dalai Lama supports the Middle Way aproach and I continue with the same policy. His Holiness introduced democracy to the Tibetan people, and I, myself, am a product or result of a democratic election. So I, too, subscribe to the universality of democracy and freedom. There is no difference in our points of view. Democracy is what we practice, what we aspire to. We made a choice because we want genuine autonomy within China, with Chinese laws. But Chinese laws do not allow democracy, and what I am trying to say is that we want real autonomy for the Tibetan people. Democracy is not part of our demand, but yes, given the choice, we want democracy any day. But when I say we want genuine autonomy within China, within the Chinese Constitution, we are not putting democracy as part of that condition. It’s not that we don’t want democracy, but once you accept the Chinese Constitution, the Chinese Constitution does not allow democracy. That is what His Holiness said and what I say: genuine autonomy, within China and within her laws. 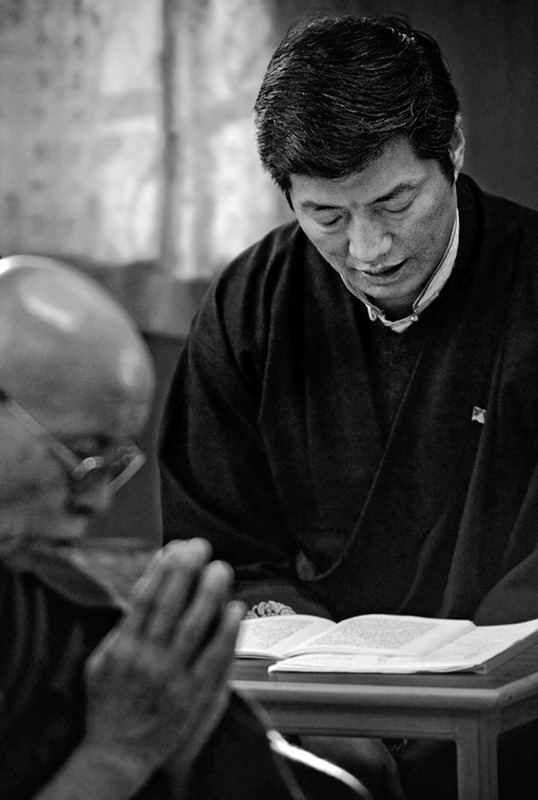 Lobsang Sangay praying for inmolated tibetans at Namgyal Monastery, Dharamsala. Autonomy means a certain degree of self-government. What type of self-government do you envision when you talk of genuine autonomy? What we aim for is practical autonomy that allows us to practice our religion, our culture and our language, and one that we are able to administer ourselves. The environment has to be protected because this is vital, and vital for all Asia. Our resources also have to be protected. What we seek is a practical and expert administration. Do you think the Chinese Government will allow you to have this genuine autonomy? I hope so, and think they should allow it. It is also in their interest. Because Hong Kong has a constititional system, as does Macao, and Shenzen, the province of Canton and Shanghai all enjoy greater autonomy. So within China many autonomies are allowed and they have special treaties with other regions. That is true, but we have very powerful reasons. We were not part of China when it was founded in 1949. Tibet had an autonomous culture and history that were and are completely different. So we seek autonomy so that our culture, religion and language may endure. So it is a completely different question. We are not asking for autonomy based on a market economy. Our emphasis will be on our culture, language and religion. In recent years, 131 Tibetans have self-immolated as a form of protest calling for democracy and freedom for Tibet. Do you think that by asking for genuine autonomy, you are to a certain degree betraying them and all political prisoners? As far as the Tibetan Central Administration is concerned, we categorically discourage self-immolation. Life is precious. We support the aspirations of those who self-immolate, and the aspirations of those who protest. We discourage the act, but we support the aspiration. I think there is some confusion in the terms in English and Tibetan. In Tibetan, independence is rangzen, while freedom is rangwangy, which means basic individual freedom. We believe that supporting the proposal of the Middle Way has to be understood as basic individual freedom for Tibetans. If the genuine autonomy you talk of is obtained, do you think they will let you and the Dalai Lama go to Tibet? Once an agreement is reached, they should allow us to return because that will be part of the agreement. Whether or not they allow me to go to Tibet is secondary, but allowing the Dalai Lama to do so would be the wisest decision, as our main concern is granting those six million Tibetans real autonomy. The Tibetans in Tibet are suffering, our environment is being destroyed, our culture is being diluted, our language is not being used and is discouraged. We want to change all that. We want Tibetans to use their own language in Tibet, practise their own culture and maintain their own traditions in Tibet; that is our primary objective. We want better conditions in Tibet than the existing ones. Democracy is also an objective, but is not our immediate goal. Our immediate objective is autonomy for the Tibetans who live imprisoned in a very harsh reality. The Chinese authoridites labelled you a terrorist, even before you were elected Prime Minister. Do you think they will accept you as a spokesperson? Why not? If they wish to do so, they can talk to whoever they wish. There are many cases in which governments call someone a terrorist, and later talk and find a solution. For example, Ian Paisley in Northern Ireland. Now, whether or not they accept me as a spokesperson or not, that too is secondary. We are very open in that regard. They talked in the past with the Dalai Lama, so they should continue to talk with him, so that we can resolve the matter of Tibet. That is our stand. So we are very flexible. What is it like to practice non violence, and yet be labelled a terrorist? Ha ha! You can only laugh at that. I spent 16 years at Harvard Law School, maybe I received some type of training there, ha ha ha! They tend to use that type of label, and, well, it’s just laughable. Talking of democracy, in the Government in exile there is no opposition or platform for political parties. Would that be a step to consider in the future or will you keep the existing structure? At the moment we are a partyless democracy, but anybody can vote, stand for election and vote for whomever they wish. We are talking of a small community of around 90,000 people. Political parties are always private initiatives, and there were a few political parties in the past, in 1992, but they did not last. That is why political parties do not have much support among the people, but nobody is preventing their existence. It is for the people to decide. This is what Tibet prefers at this moment. If there were political parties, I would not have won these elections because I come from outside the system, I am young, I had never been in Dharamsala before nor been part of the administration, nor was I a member of Parliament. I hadn’t been a minister or a secretary, or even a bureaucrat. I came from nothing. That is the beauty of Tibet’s democratic system, that anyone can vote for whoever they want and surprises can happen. If there were political parties, the establishment would control the process and only the establishment’s candidates would win. Given that Tibetans in Tibet are being silenced, do you feel that the diaspora has the responsibility to preserve Tibetan identity for future generations? Of course! 90% of our monasteries and nunneries were destroyed, and they have tried to destroy Tibet’s Buddhist civilisation, so we have to preserve and revive them and thrive because our civilisation is at stake. Without a doubt we are doing the best we can. We have to rebuild and revive in exile all the major monasteries that were destroyed in Tibet. Things are happening inside Tibet, and I think our Buddhist civilisation is very much alive now. What is your opinion of the lawsuits in Spain for justice in Tibet and the “Agenda for your consideration” submitted to the Tibetan Parliament in support of international law and universal justice for tibet, which mentions the lawsuits in Spain? Spain’s National High Court accepted the cases that had been filed by individual Tibetans, including Thubten Wangchen, so for them it was symbolic, but nonetheless, it was a verdict of justice. I sent a message to Tibetans throughout the world, including inside Tibet, that justice can prevail even symbolically, but then there was, there is a pause in the jurisdiction process. It is perplexing that with the lawsuits already under investigation, a law that was already approved can then be retracted. This sends mixed signals to Tibetans around the world. There are places in the world where tradition is not permitted, yet the law should follow its course. Will there be any type of formal stand with regard to this? We are not going to take any formal stand. As far as the Tibetan Central Administration is concerned, we are most concerned with the Tibetans who live in Tibet, and the Middle Way is the strategy to find a solution for Tibetans.